FRISCO, Texas (Jan. 16, 2019) — The US Youth Soccer National League girls teams will resume league play Jan. 19-21 at the Premier Sports Campus in Lakewood Ranch, Fla. 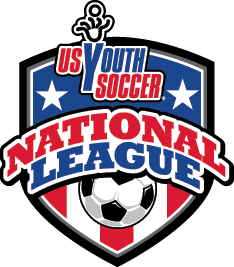 In addition to the National League matches, 22 US Youth Soccer National League Conference teams will be competing in showcase games at the event. The National League schedule for Lakewood Ranch features four of the eight teams per division in the 15U through 19U age groups, meaning 72 girls teams will take the fields to play the next three games of their National League season. Each matchup holds great importance in determining which teams will punch their ticket to the 2019 US Youth Soccer National Championships, held July 23-28 in Overland Park, Kan.
After the National League girls sides played competitive matches in North Carolina to open their seasons, nearly every division has several teams in position to contend for the title. The first place team’s lead is three points or less in 16 of the 18 divisions in the 15U-19U Girls age groups. The National League girls teams that do not compete in Lakewood Ranch will complete their season March 15-17 at the Players College Showcase in Las Vegas.